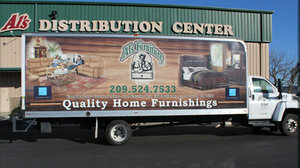 Al’s Furniture Distribution Center, built in 2002, encompasses 42,000 sq ft on two acres. It’s home for all incoming and outgoing furniture. It features unloading docks for Semi’s, three loading docks for our trucks and two pick-up docks for customer pick-ups. This distribution center was designed after Rick traveled around studying other warehouses in order to design the perfect furniture warehouse for our customers. Our warehouse and delivery teams, un-box, clean, and inspect every piece of furniture as if it where for the owners, Rick and Kerry. So whether your picking furniture up or having it delivered we guarantee it to be right! 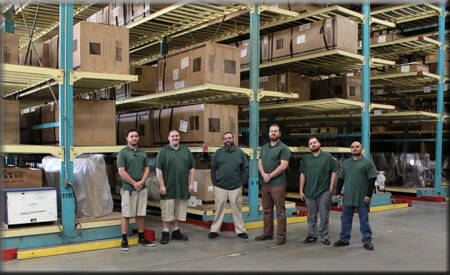 On delivery, Al’s Team completely sets up and puts together each and every piece of furniture. Once it’s in your home our team will completely clean each and every piece. Before we leave we have you sign off that you have received it and are happy with your delivery. I am Greg Johnson. I started here at Al’s right out of High School, as a part time carry out guy. Over the years I have learned to assemble sand and finish furniture. Since then I’ve been to several schools to sharpen my skills of upholstery and leather repair. I moved to our distribution center when it opened in 2002 and in 2009 I was promoted to Assistant Manager of operations at this location. In 2018, I was promoted to Warehouse Manager. I help oversee all warehouse employees and schedule deliveries. I enjoy making customers happy through excellent service. Hi my name is Josh Wilson, I am the Assistant Manager at our warehouse. I started out doing deliveries about 5 years ago and worked my way into the repair department, since then I have sharpened my repair abilities and have worked my way up to Assistant Manager. As Assistant Manger, I help oversee the warehouse employees and schedule deliveries. I am always willing to help out with any and everything I can. At Al’s Furniture, we take pride in our excellent customer service skills, and strive to put out the best product we can. We strive to make our customers as happy as possible.